It’s obvious that some Orthodox are not willing to move quickly — if at all — toward unity with Catholics, and many Orthodox would first require some reassurances, if not bold action, on several issues, beginning perhaps with the filioque. 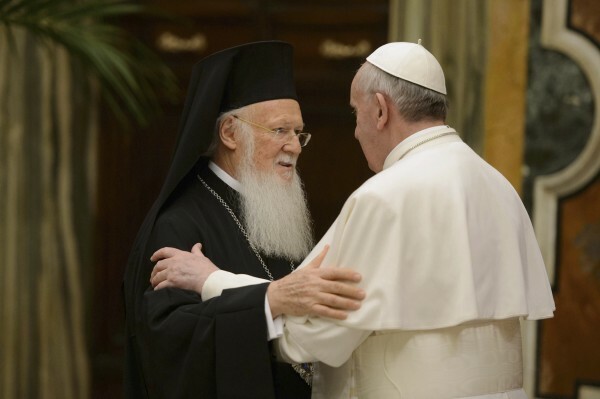 The Ecumenical Patriarch, the titular leader of Orthodox Christians, met recently with Pope Francis in Jerusalem, and said afterward that both agreed to meet in Nicaea (modern Iznik) in 2025. This is potentially huge news, because Nicaea was the site of the first ecumenical council. Neither man is likely to be alive in 2025, so the promise here is largely symbolic. Still, it’s a big deal for East-West relations, if not nearly a big a deal as some of us would like to think. Other areas touch on Church discipline and governance. Those teaching Catholic theology in the name of the Church would need to do so in a demonstrably faithful (“orthodox”) way. Those celebrating the Church’s liturgy would need to do so in a way that avoids much of the silliness, the slovenliness and the banality that still afflict Masses today. The Orthodox would want to know that their own system of electing and disciplining bishops would remain free of Roman curial interference. And they would want it clearly understood that their own tradition (which is also the tradition of Eastern Catholics and those Anglican and Lutheran clergy who are now Catholic priests) of ordaining married men to the priesthood would remain untouched, and nobody would be forced to adopt celibacy. Another area, which few of us have begun seriously to grapple with, touches both doctrine and discipline: marriage. Here, if anywhere, is where ecumenism becomes real for many people living in mixed or irregular marriages. There’s a lot more in the DeVille piece that makes it must reading for anyone seeking to understand this issue. I am not hopeful that this will happen before the Parousia, but I find these basic steps encouraging.